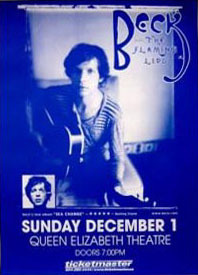 All the Beck/Lips shows sounded pretty much the same, and this is no exception. Beck's voice is in strong shape throughout. "Get Real Paid" grows into a bit of a robot jam. "Lonesome Tears," as was its way at the time, stole the show. "Paper Tiger" was dedicated to Dolph Lungren.